› Where: In-Town Gallery, 26A Frazier Ave.
› When: Through Aug. 31. Gallery open 11 a.m.-6 p.m. Monday-Saturday, 1-5 p.m. Sundays. › Online: www.intowngallery.com and on Facebook. 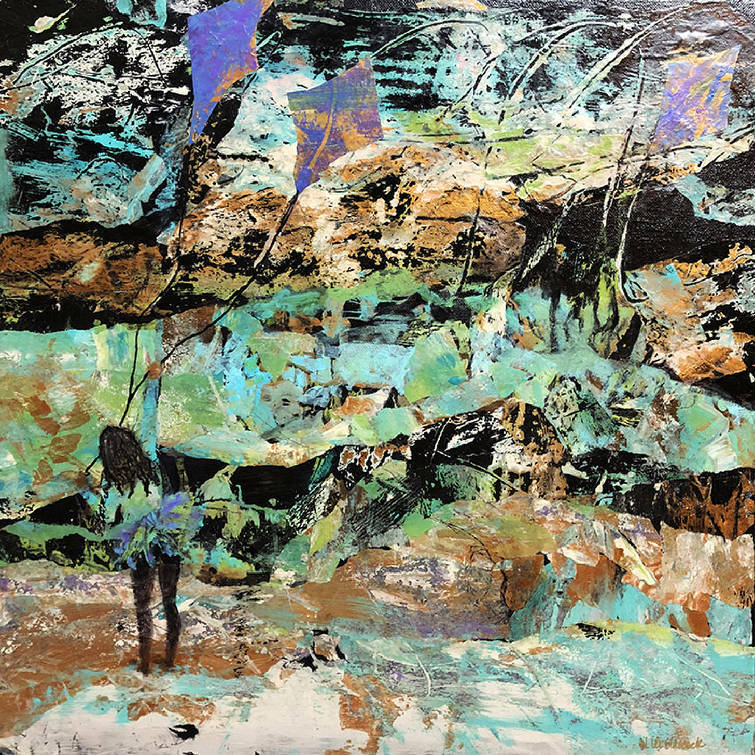 Five of Chattanooga's foremost mixed-media artists have works featured this month at In-Town Gallery, which offers contemporary and fine art by 32 local and regional artists. 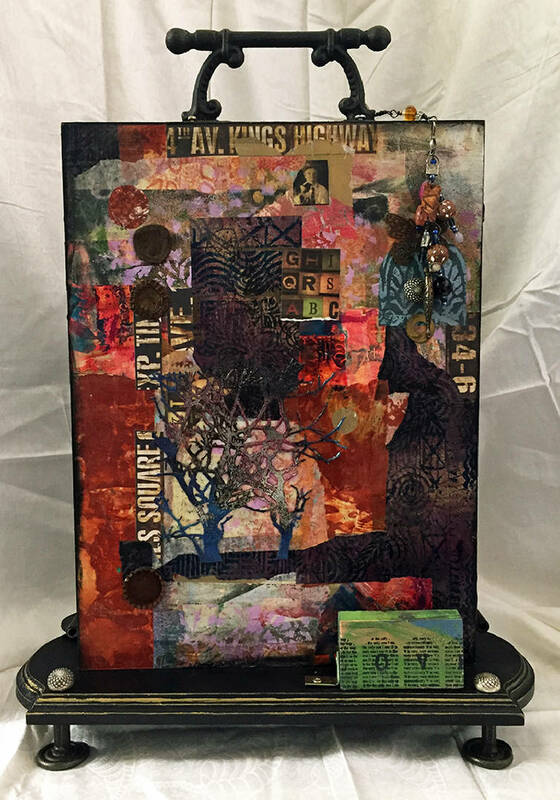 Here's a look at how a combination of paint, paper, beads, glass, fabric, found objects and other materials have come together to create the wall art and three-dimensional artwork of August's "Contemporary Mix." -Sandra Washburn has taught and collaborated with each of the other artists. A painter who does not limit herself to canvas, she has several assemblages in this show in which she creates miniature worlds. For "Nocturne of the Huntress," she began with a box on which she painted a background, then added such things as found metal objects, gold leaf and stained glass to build an evocative vision exploring the idea of the mythological goddess Diana. -Lee Glascock creates her dramatic wall art with acrylic paint and a free manipulation of the surface. Glascock uses various acrylic media and substrates, which she textures with such things as sand (or in one case even garnet dust) to build a complex surface on which she paints. For "Soaring," she added torn hand-colored papers to achieve the complex effects. -Linda Kerlin is a painter who has increasingly turned her attention to working with constructions made with found objects. She particularly likes using antique items she finds, repurposing them in unexpected ways. She also loves to add baskets to her work by cutting them or attaching them to her built sculptures. "I think of my three-dimensional work almost as shrines," she says, which is suggested by titles like "Motherhood of Giving." -Janice Kindred says emotion plays a central role in her creations. "When you put emotion into your work, hopefully you'll connect to the person looking at it," she says. "Sedimentary Range" is a good example. 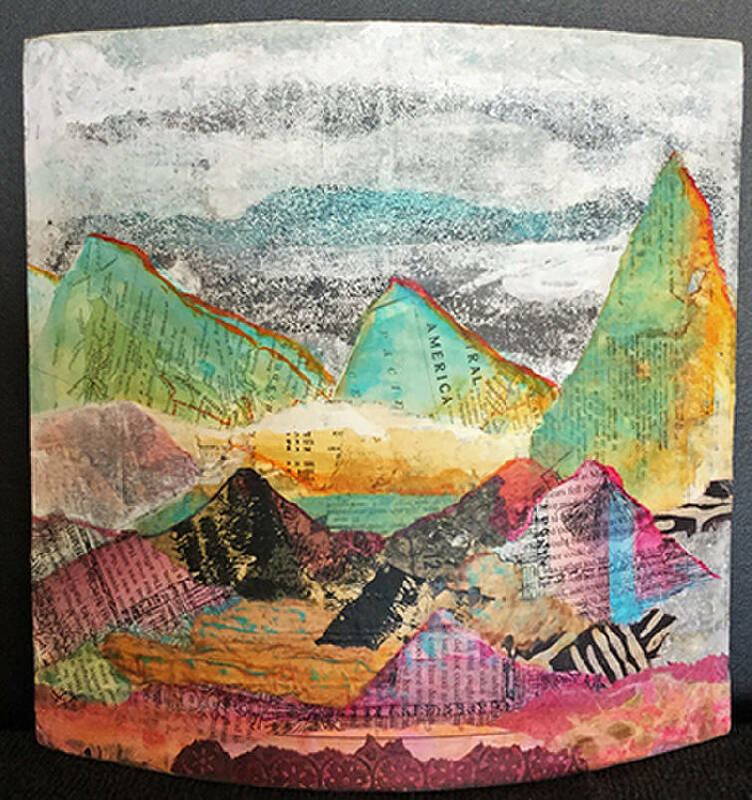 This 10- by 10-inch piece, which can be hung on a wall or set on a flat surface, is a collage composed of fabrics, textured papers, Japanese papers and map pieces mounted to a curved wooden board. As Kindred explains, "Inspiration for this piece came to me when I matched the atlas pieces with a curved board, which suggested to me the Earth globes that intrigued me as a child. Expanding and deepening this idea, I used similar colors and textured papers to finish my composition." -Linda Wicksell, who began as a representational painter, turned to mixed media shortly before coming to Chattanooga. However, she began working with mixed media in earnest when she met Washburn. Wicksell's mixed-media pieces, she says, develop intuitively, usually starting with an image that she enlarges upon. Sometimes the source of her work can come from surprising places. Such was the case with "Bird's Eye View." Wicksell says, "I noticed the paper I was using to clean my brush had, just randomly, developed into an interesting image. I pasted that onto a canvas and began developing the painting around it." Her work is noted for an evocative use of color and texture.